Life would be better if going to the doctor were like going to the bar. Life would be better if going to the doctor were like going to the bar. Way back in the days of yore, it used to be. Apothecaries, which were like pharmacists and doctors and herbalists rolled into one, often prescribed bitters and tinctures (alcohol-based infusions) to their customers. Now, sadly, your doctor won’t write you a script for Angostura—but mixologist Albert Trummer will. The man who brought the apothecary-influenced Apothéke to New York City is opening The Drawing Room at the Shelborne Wyndham in Miami this October. There, he’ll use his “little formula book” to make elixirs and cocktails designed to cure customers’ ailments. Don’t expect to find aspirin-laced martinis or even medical marijuana-infused Manhattans on the menu. “I don’t want to compete with Pfizer,” Trummer says. His cocktails, elixirs and bitters are all made with natural (and legal) herbs, spices and fruits. Here, a few of Trummer’s most useful prescriptions. For his green market take on a classic gin and tonic, Trummer pours an herbaceous gin like Bombay Sapphire over fresh thyme, basil and cucumber. He tops it with Fever-Tree tonic water and house-made herbal bitters. Both thyme and rosemary are known to be natural stress relievers—and, of course, the alcohol content doesn’t hurt. 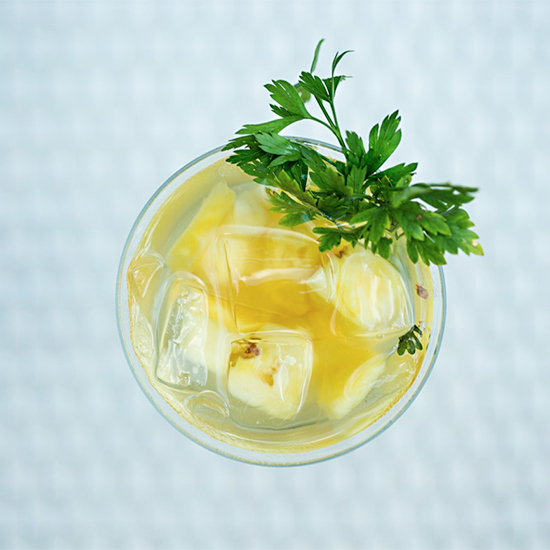 For this painkilling cocktail, Trummer mixes muddled pineapple with Santa Teresa Rum, fresh lime juice and, the key ingredient, his own elixir #5. He makes the elixir with a tequila and mezcal base. “The Aztecs used to muddle blue agave and brew it to help relieve pain,” Trummer explains. Also in the elixir: herbs, habanero peppers (spicy peppers are known to help relieve pain) and aloe (whose curative powers anyone prone to burns will know well). “I practice this drink on myself because I have to fly all over the place,” says Trummer. He mixes a super-herbal sweet vermouth like one from Torino with Campari, gin and a few drops of his vanilla elixir. The vanilla doesn’t add sweetness, just the essence of vanilla. “I have two of those and I am over the jet lag,” he says. For people with blocked-up sinuses, Trummer serves a saffron-infused bourbon with rhubarb, celery and lavender essences. “It’s very cleansing,” he says. “I think there’s a happy hormone in Champagne,” Trummer says. To lift spirits, he recommends the occasional morning glass of Champagne with his own chocolate bitters made with cocoa beans, Cognac, a few drops of Angostura and some melted Valrhona chocolate.